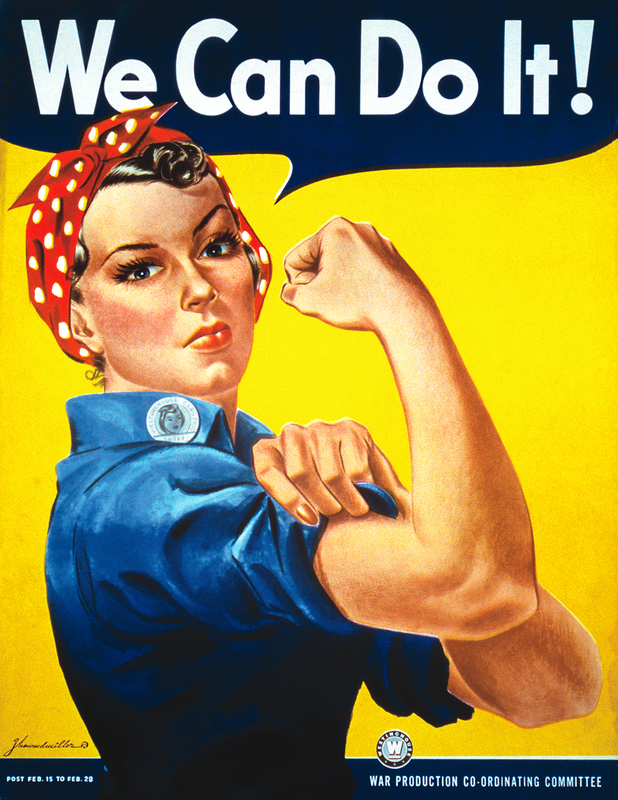 The “Rosie the Riveter” image (pictured above) is iconic. When I see it, I think about strong, passionate women working to accomplish their goals and achieve their dreams. But those thoughts aren’t what the image was originally intended to inspire. Originally designed by artist J. Howard Miller for an electric and manufacturing company, it’s purpose was to entice, encourage, and empower women to work in jobs typically filled but vacated by the men serving abroad in WWII. This particular image, and the other propaganda stressing it was women’s duty to help end the war by working in the vacated positions, was wildly successful in encouraging women to work and keeping the industries running during the war. Women flooded the traditionally male-dominated industries (like aviation and manufacturing), increasing the total number of women in the workforce by six million in five years. In the end, the Rosies contributed a great deal to the American economy and the Allie’s victory. Today, women remain an integral part of the workforce but are underrepresented in many industries including the technology sector, and especially in the startup community. To address this disparity and “level the field,” Triangle Startup Weekend is proud to bring you the first-ever Triangle Startup Weekend: Women on October 10th-12th, 2014 at HQ Raleigh. Like the “Rosie the Riveter” campaign, we hope the event will entice, encourage, and empower women to get involved in the Triangle’s startup community. However, the event is NOT exclusively for women! Our goal is to increase female participation from 20% to 50%, not displace men and discourage their participation. We want men AND women to collaborate, support and encourage each other as they work together to build a startup in 54 hours. The weekend will operate like a traditional startup weekend, with just a few tweaks to make it more female friendly. For example, we’re working on offering some childcare options so women and men with children can participate. This is definitely a can’t-miss event, so check out the details on our homepage, sign up on our eventbrite page (earlybird special runs through 9/10 only! ), spread the word and check back in for more details! We hope you’ll join us in our mission to increase female participation in the Triangle’s startup community.